Feel what it was like to serve as a sailor in All Hands on Deck: A Sailor’s Life in 1812. 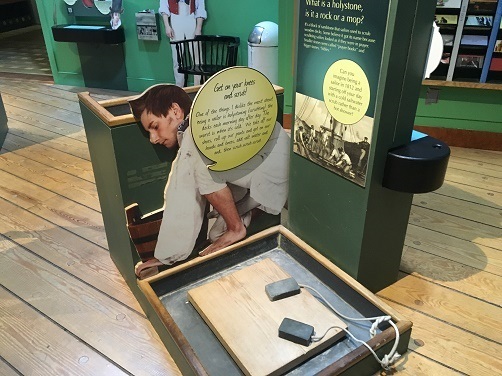 This fantastic upstairs exhibit includes climbing onto a scaled model of a yard and furling a sail, reclining back in authentic canvas hammocks that the sailors would have slept in, and even getting on your hands and knees, grabbing a holystone, and feeling what it was like to scrub the deck of the ship. “It’s building that sense of appreciation for what it was like to serve aboard the ship,” says Rand, “learning what it was like, standing aboard the ship, climbing.” More than actions, guests will get to “meet” the sailors that help keep the USS Constitution afloat. “The personal stories are what I like best,” says Rand, “when you can bring to life someone like that through the tiny bits of research we’ve done.” Along the walls of the exhibit are life-sized cutouts of notable crew members, each with a plaque telling their own unique story aboard the USS Constitution. When is the best time to visit? Summer certainly seems to be the busiest, so to avoid crowds plan on a spring or fall outing. “Over 96,000 visitors in one month, July,” says Rand, “that is a lot to keep us busy.” No matter what time of year, the museum and the USS Constitution is the perfect attraction for any family’s budget- it’s free! The museum only asks for donations, and their main goal is to share their love of the ship’s history. “The Constitution museum offers a hands-on and minds-on experience of life at sea 200 years ago aboard Old Iron Sides and makes history fun and exciting for all ages,” says Rand. Starting in 2018 the USS Constitution will be offering harbor cruises. “It takes a while to get her fully re-rigged,” says Rand. “Next year she’ll be afloat again and back to her glory.” Seats aboard the harbor cruises are awarded via participation in a public lottery, so history buffs stay sharp and watch for news.